Kat is over the rumors, the insults, the cruel jokes made at her expense. It all goes back to one person--her ex-best friend. Someone needs to teach her a lesson, and, with Lillia and Mary behind her, Kat feels up to the task. Four years ago, Mary left Jar Island because of a boy. But she’s not the same girl anymore. Now that she’s got friends who have her back, he's going to be in big trouble. This book is told from three alternating points-of-view. You have three main characters, all of which are stereotypical high-school students. You have Mary: typical shy girl, gets bullied; then you have Kat: rebel teenager acting wild all the time, no cares given; last but not least, you have Lillia; super smart, successful, overachiever. Did I mention she's Asian? So yeah, pretty cliche characters, I know. Fortunately that was a pretty easy factor to get past. Because regardless of the stereotypes, they were pretty intricate and interesting characters. Not to mention that the story itself was marvelous. The thing about this book (series in general) is that it centers around revenge. It also deals with a rich-kid problems type scenario. Consequently, there is a lot of drama. I'm not one to typically enjoy very dramatic books, but there was just something about this one that really pulled me in. It was one of those books that you start reading and before you know it, you reach the "Acknowledgements" page. Then you panic and feel like you could kill someone just to get your hand on the second book. Which goes to say that it is a very fast-paced book. I swear you won't find a single boring point in this book. I think both authors really succeeded at making this a very enthralling read. I was a really big fan of the writing and writing-style. Having it told from each of the girl's point-of-view was merely fantastic. Mainly because each of them was so distinct from one another and so it was very to have a first-hand insight into what they all thought individually of the situations that were taking place. Something I wanted to mention that might not appeal to many people, is the love "triangle". Which I believe I can't really classify as a "triangle" because it kind of passes that three people mark lol. Like I said, there is a lot of drama, and a lot of it is romance-induced. Mixed in with jealousy and all that good stuff. However, it didn't get annoying or obnoxious considering- well- all of that. I guess it's mainly due to the fact that there were many things going on and all of them just kind of weaved together in a way that you can't really focus on one thing only. You just take everything as a whole thus you get very engrossed in the story. One more thing I wanted to mention, don't judge this book/series by it's cover. Believe me, it is not what you expect. Also, there are PLENTY of plot-twists throughout the whole series, Which, in my opinion, makes it all the better. 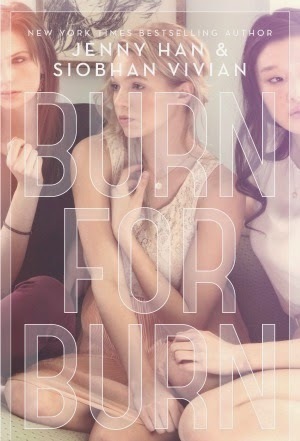 After reading the Summer trilogy by Jenny Han, I was really interested in starting another of her series. This one sounds really cool. Great review! I loved the Summer trilogy! This one, while being totally different, is amazing and I really recommend you read it! Then you will love this trilogy! I personally found the love-triangle to be written quite well. ANd all the revenge and drama aspects were on-point! It's a pretty addictive read!